Why Does Devin Nunes Still Have a Job? As the Senate Intelligence Committee opens its first hearings into Russian interference into the U.S. election, Nunes's partisan buffoonery looks worse and worse. Senators Richard Burr and Mark Warner were laying it on a little thick at a bipartisan press conference Wednesday. The Republican and Democratic leaders of the Senate Intelligence Committee were busy reassuring reporters that they can work together on a bipartisan investigation into allegations that Trump associates may have “coordinated” with Russian officials to sabotage the campaign of Hillary Clinton last year. A reporter suggested, “without naming another committee,” that the senate panel outshone its House counterpart on issues of integrity and process. Republican Richard Burr ignored the bait but praised the smooth way his committee members and staff had been able to work with the intelligence community, a contrast with the effort led by Nunes. On Thursday, Burr and Warner got down to work, calling their committee to order. Over on the House side, by contrast, Devin Nunes’s House Intelligence Committee is has gone off the rails. It has absolutely no hearings scheduled, its members are in open warfare, and Nunes is facing bipartisan calls to either recuse himself or step down as chair, after his poorly scripted spy-movie jag to and from and to the White House, to examine what he concluded was probably inadvertent surveillance of Trump transition team members. (This came, you’ll recall, after Trump claimed, with zero evidence, that President Obama had illegally “tapped” his phones in Trump Tower.) Nunes informed Trump and House Speaker Paul Ryan, as well as the press, about finding possible inadvertent surveillance of Trump transition officials before telling his supposed committee partner, ranking member Adam Schiff — because the president needed to know his findings right away, he said. “I felt like I had a duty and obligation to tell him because, as you know, he’s been taking a lot of heat in the news media,” he told his sympathetic friend Sean Hannity on Fox. It must be said that the subject of 17 intelligence community probes, plus two legislative committee investigations, is naturally going to be “taking a lot of heat in the news media.” Especially after he falsely accused his predecessor of illegally spying on him – without evidence. The notion that the House Intelligence Committee chair thought it was his job to cool the furrowed orange brow of Dear Leader should concern every American. Especially House Speaker Paul Ryan, who’s in charge of this august body. Oh, but Ryan was in on Nunes’s warning to Trump, so he’s cool with it. Asked whether Nunes should recuse himself, Ryan was terse but clear: “No, no, no,” he told reporters. Nunes was equally tightlipped, but confident, almost belligerent: “Why should I?” he told a reporter. Why? Because he’s made it clear that he can’t be impartial when it comes to this investigation into the Trump team’s increasingly obvious ties to Russia. Unilaterally, he decided to cancel a planned hearing this week with Obama era intelligence officials, including former Deputy Attorney General Sally Yates and former Director of National Intelligence James Clapper. Nunes canceled the hearing to invite FBI director James Comey to return to the committee in closed session—and then he canceled that one, too. Neither has been rescheduled. Now Nunes is farcically blaming the Democrats for the slowdown of his committee’s work. “It appears like Democrats aren’t very interested,” he mused on Wednesday. But ranking member Adam Schiff sounded very, very interested in an interview with Rachel Maddow Wednesday night. “We can’t have a credible investigation if one of the members, especially the chair, is freelancing,” he told Maddow. Rep. Eric Swalwell seemed to go further with MSNBC’s Lawrence O’Donnell: “The chairman panicked. 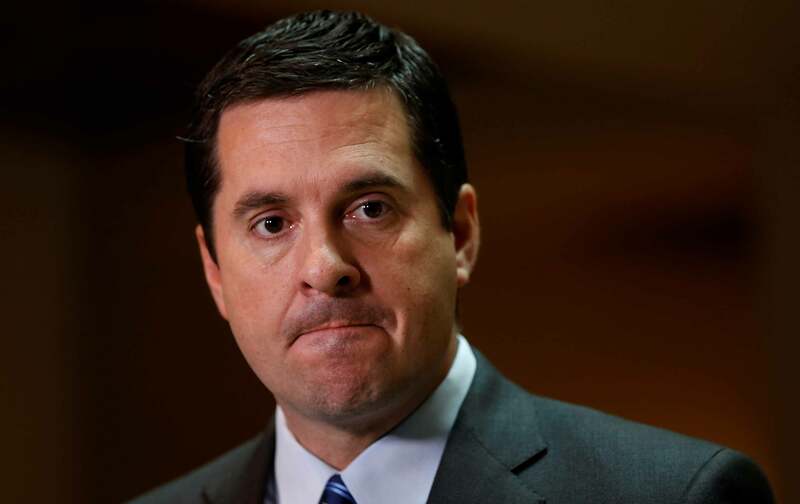 It looks like he is now working with the White House instead of showing the independence that we need to show.” There is growing suspicion that Nunes has encountered evidence that could well cause trouble for Trump, and has thrown his own committee into chaos rather than look into it. Meanwhile, the Senate Intelligence Committee is doing its best to show that a bipartisan Congressional approach to this crisis is still possible. Since Paul Ryan is comfortable with—in fact, complicit in—Nunes’s bizarre partisanship, it’s the only show in town right now. Joan WalshTwitterJoan Walsh, The Nation’s national-affairs correspondent, is the author of What’s the Matter With White People? Finding Our Way in the Next America.